Here’s the document which is distributed to PA Game Commission employees regarding the proper design for an electric bear fence. 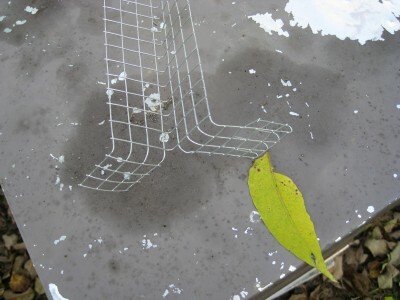 The design is based on Craig Cella’s article in “Bee Culture” magazine. Thanks to Craig for sharing this with us at our March 2013 meeting. The last few months of a long, cold winter are a dangerous time for your hives. Colonies which have survived into January and February are in danger of starvation should they exhaust their supplies of stored honey. It would be an absolute shame if a colony which survived the harsh winter months starved out in early March. 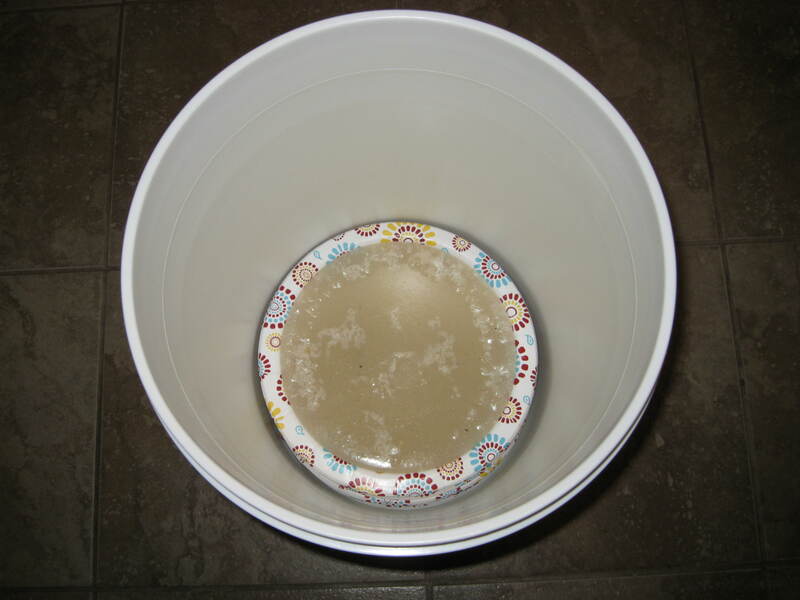 Clean 5-Gallon bucket for storage. 1) Add the water to your stock pot, and bring it to a boil over medium heat. 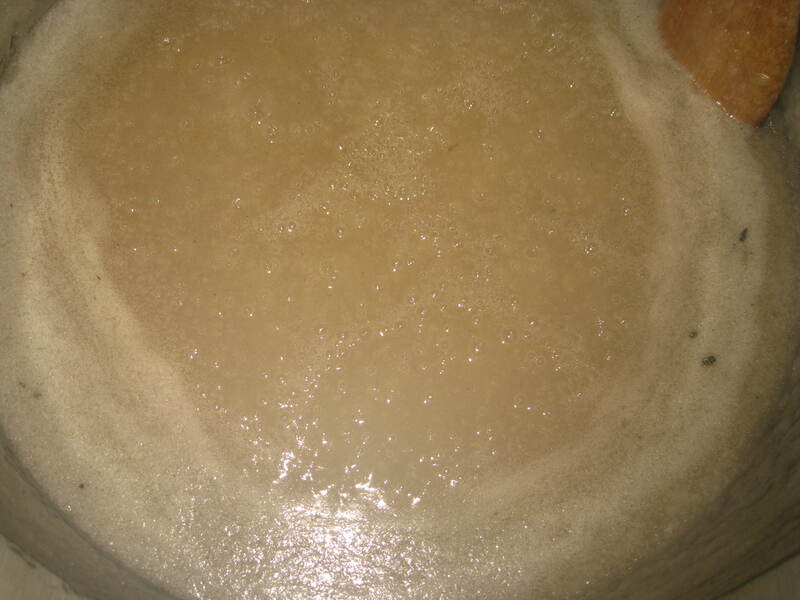 2) When the water begins to boil, add one pound of sugar and stir until it dissolves. A 16 ounce plastic Solo cup makes for a convenient scoop which holds one pound of granulated sugar. 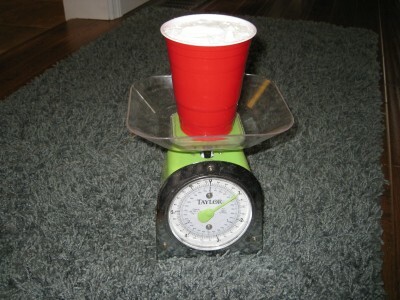 3) Continue adding the sugar, one pound at a time, until it is all dissolved. Your final ratio will be 10 parts of sugar to one part of water. 4) Continue to heat the mixture until it just begins to boil. 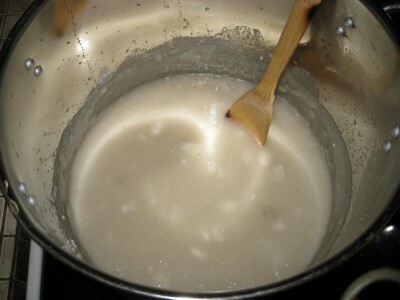 The mixture will turn a light beige color. 5) Remove the mixture from the heat. 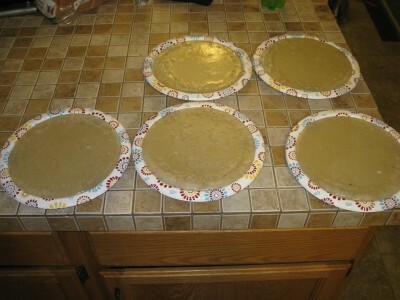 6) Place 6 full-size paper plates on a heat-resistant surface, and then fill each with the sugar solution. For a 10lb batch, I usually fill five plates. Put on your bee suit — this stuff is hot and can cause sweet-tasting burns. 7) After the candy sets (about an hour), transfer the plates to your 5-gallon bucket for easy transport to your beeyard. Leave the candy on the plates, otherwise they will stick together in your bucket. Now you’re ready to feed your bees! 1) Wait for a warm day. 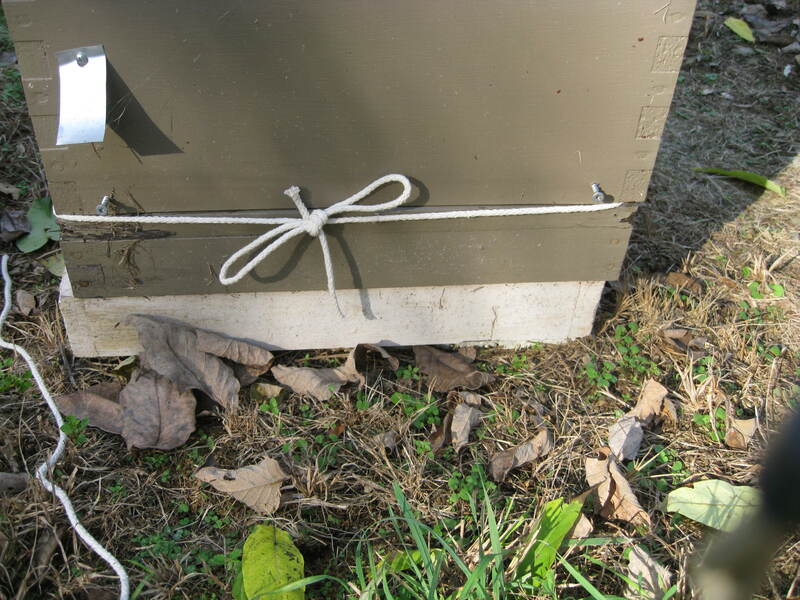 Do not open your hives if the bees are not flying. Typically, you’ll be looking for a day in the mid-40’s. 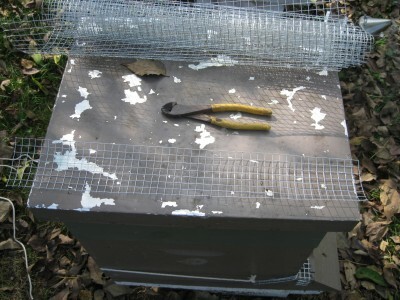 2) Remove the hive’s outer cover and inner cover. 3) Place an empty super on top of your hive. 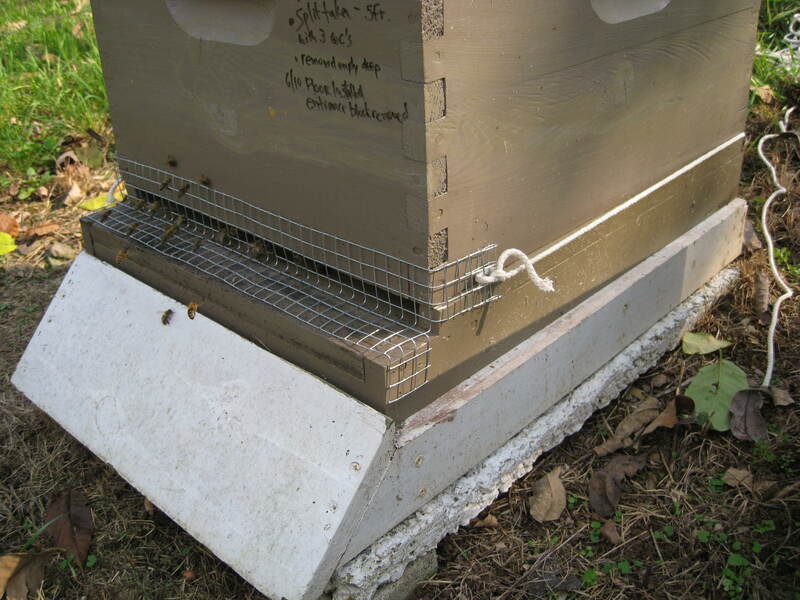 You can also use a simple 2″ spacer with the same dimensions as your hive. 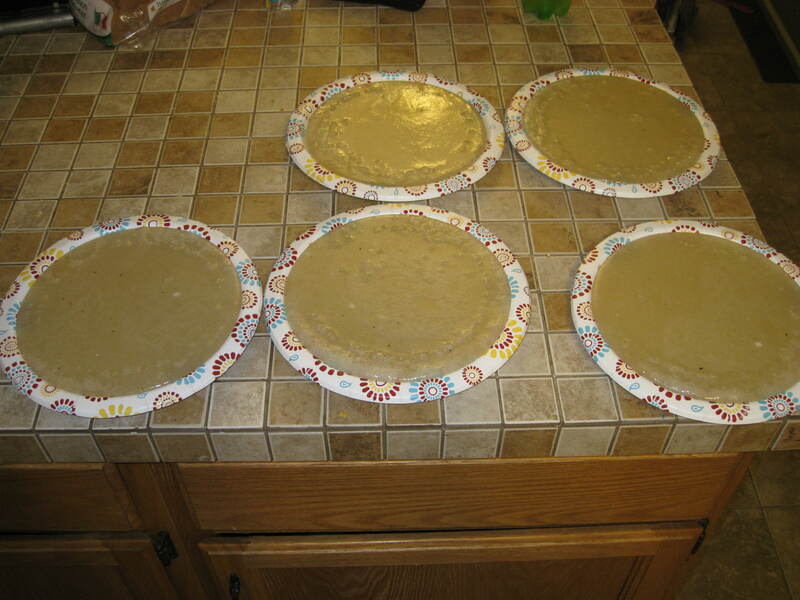 4) Pop the candy discs out of the paper plates, and stack them inside of the empty super near the center of the hive. 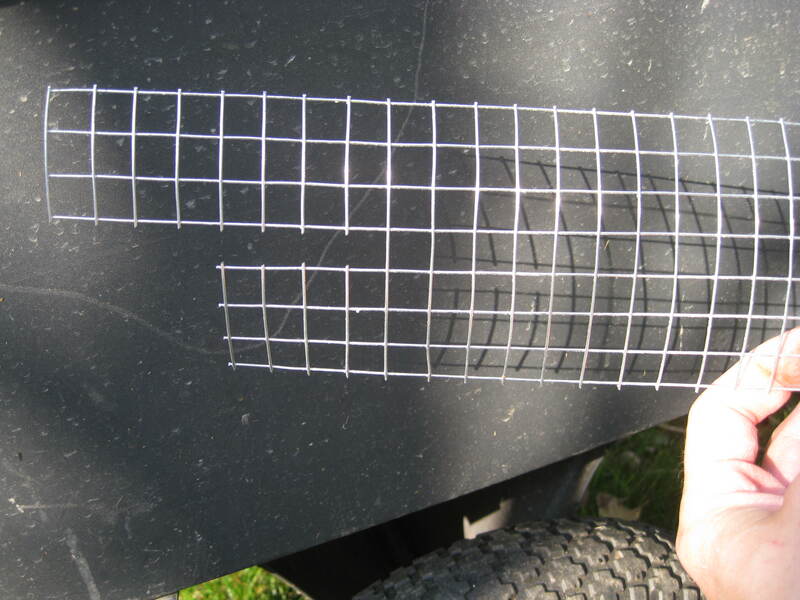 5) Replace your inner cover, outer cover, and rock. Make some candy, and feed your bees! Winter is coming, the nights are getting colder, and the field mice are looking for a cozy spot to spend the winter. A warm hive is very attractive to a cold mouse, so it’s important to install mouse guards on all of your hives. Here in Pennsylvania, I aim to have my mouse guards in place by the first weekend in October. At EAS 2012, I attended a presentation by Allen Hayes. 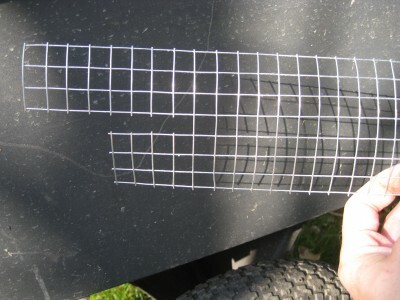 During his talk, Allen showed his simple and elegant design for mouse guards, constructed out of nothing but #2 (1/2″) hardware cloth and string. 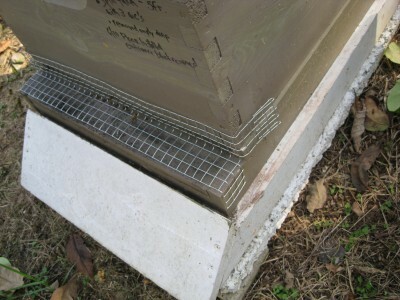 This year, I installed several mouse guards of this style on my hives and am confident that they’ll do their job. To get started, all you’ll need is some 24″ wide #2 (1/2″) hardware cloth. Our local Cole’s hardware store sells a 10ft roll pre-packaged for six dollars. Step 1: Cut a 7-square section of 24″ wide hardware cloth. Step 2: Cut the hardware cloth on both ends as shown. Step 3: Fold the hardware cloth as shown. 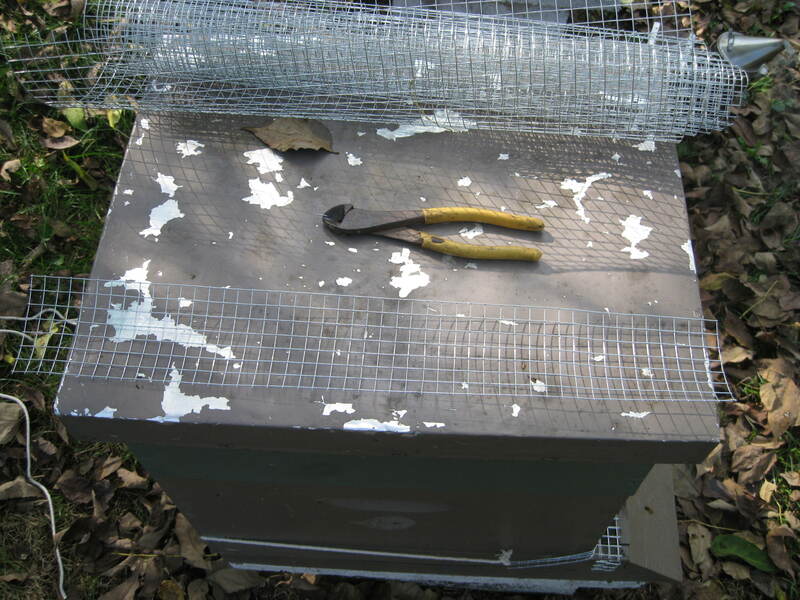 Step 4: Slip the mouse guard over your hive entrance. 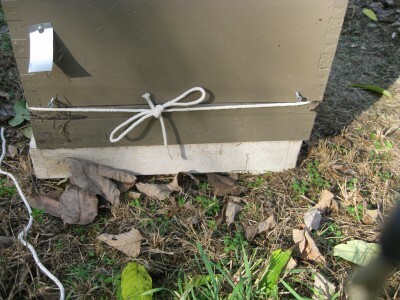 Step 5: Affix the mouse guard to your hive body using two short lengths of string. That’s it! These mouse guards are easy and cheap. Best of all, they leave no nail or screw holes in your bottom boards.